EVGA 400W N1 Series. 2 Year Warranty & EVGA's 24/7 Technical Support. Compatible Part Numbers: RV1C4, J50TW, 2TXYM, 3WN11, 709MT, 592JG, 66VFV. Compatible Part Numbers: RV1C4, J50TW, 2TXYM, 3WN11, 709MT, 592JG, 66VFV. Optiplex 790 Small Form Factor (SFF). Optiplex 990 Small Form Factor (SFF). Complies With ATX 12V 2.3 Version. Super Quiet Performance! Quiet Performance. Noise Level Maximum of 32db at 100% system loading. 120mm large fan design for optimal system cooling and maximizing performance. SLI (Scalable Link Interface) Ready. Quiet Performance. Compatible models shown above are for reference purpose only. not all compatible models are listed. High energy efficiency. 120mm large fan design for optimal system cooling and maximizing performance. Features:Single ball bearing fan design,single cooling fan.Built-in voltage overload protecting.Support for Intel and for AMD.Support overvoltage protective and shortage protective design.Built-in quiet single cooling fan.Complies with for Intel for AMD for ATX specification.Descriptions:A better power supply that can provide stable power to your PC system without frequent reset,Quiet performance and exquisite workmanship.High efficiency,low energy consumption.It is more convenient to use.Massive 120mm fan draws heat from CPU area and cools the power supply.Specifications:Color:blackItem Size:15*14*8.2cmPackage Size:22*15.5*8.5cmAC input:110V/220V AC 5A 50/60HZPower:Max 650WDC Output:25A 3.3V,25A 5V,19A 12V1,19A 12V2,19A 12V3,0.8A -12V,. Output Power 300 Watt. MTBF 100,000 Hours on Maximum Load at 25°C. Usage note Compatible models shown above are for reference purpose only. not all compatible models are listed. Current 13A 0.5A 9A 9A 0.8A 13A 2.5A. Apple A1083 HD Cinema Display 30". Compatible with: A1098 A1097 A1096. Output: 24V 6.25A 150W. Apple A1082 HD Cinema Display 23". Apple A1081 HD Cinema Display 20". Type: Flex ATX. Connector included: ATX Connector Mini 24 Pin X 1 PC, P4-12V 4 Pin X 1 PC, SATA 15 Pin X 2PC, Molex 4 Pin X 2 PC, Floppy 4 Pin X 1 PC. Compatible models shown above are for reference purpose only. 120mm large fan design for optimal system cooling and maximizing performance. -Noise Level Maximum of 37db at 100% System Loading. Compatible models shown above are for reference purpose only. not all compatible models are listed. 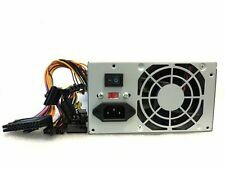 500W Upgrade Power Supply for Dell CPB09-001B - FREE SHIPPING! It's a feature that will benefit, not harm your system performance. Energy Star Efficiency. Complies with FCC part 15J class B 115Vac Operation and CISPR22 230Vac Operation. 100% Hi-pot & Function (Chroma)tested. 300 Watt Output 12 Volt DC Input. Output: 3.30V, 5.00VSB, 5.00V, 12.00V, -12.00V. 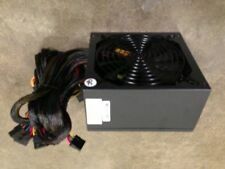 1800W Special Power Supply For S7 S9 Mining Machine Note：The Voltage Range is AC 176~264V，if the Voltage in Your Area is 110V You Will Need a Power Inverter to Make it Work. Model: 1800W Shell Material: Aluminum Size(L*W*H): 25.5 x 10 x 4.5 cm Cable Length: 39 cm Power Cord Length: 1.5 Meter Connectors: 6 PIN X 10 Pcs Number of Interfaces:10 Fit For: S9(12.5T/13T/13.5T/14T) S7 Ant Series Mining Machine Input Characteristic: Voltage Range: AC 176~264 V Input Rated Voltage: AC 200~240 V Starting Inrush Current: ≤80 A Maximum Input Current: ≤15 A Efficiency: ≥93% Output Characteristic: Output Rated Voltage:DC 12.25 V Load Regulation: ≤±2% Linear Regulation: ≤±1% Rated Output Power: 1800W(Max) Output Current: 0~150 A Output Ripple And Noise: ≤120 mVp-p Drive And Shut. 1 - Premium breakout board with on/off switch and 10 Ports. 10 port breakout board with on/off switch. This kit can be used to power but not limited to the following GPUs. Radeon Pro Duo. Radeon™ R9 280x Graphics Cards. Interface:1x24P 1x8P 1x6P to 6 2P 1x(1 4P 2 SATA) 1x(1 4P 2 SATA). ★Using 14cm hydraulic bearing LED fan, Green LED light fan, e fficient and energy-saving silent fan, standby power 1W. PFC Type: Active PFC. 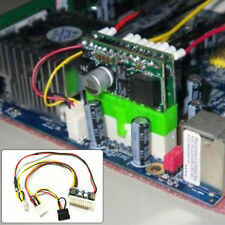 - Comply with ATX 12V V2.3. Material:Aluminum alloy Shell Copper cable. Power output line: About 50cm/19.7". Rated Output Power: 700W. - 20 4PIN connector for M/B. 1 x Cable (US/AU/EU Plug). Description:Brand New and High quality , good operation.New Desk Dell computer power supply. This Dell part is 235 watts. 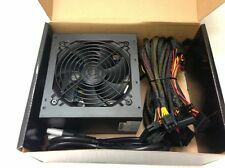 This power supply only works with the small form factor versions of the computers listed below.Shipping from the USA.DP Number: FR610, PW116, RM112, 67T67, R224M, WU136 R225M, G185TPart Number: H235P-00, H235E-00, F235E-00, L235P-01, AC235AS-00, PS-5231-5DF-LF, HP-D2351A0, HP-D2352AOModel Number:For DELL Optiplex 760 Small Form Factor (SFF)For DELL Optiplex 780 Small Form Factor (SFF)For DELL Optiplex 960 Small Form Factor (SFF)For DELL Optiplex 980 Small Form Factor (SFF)For DELL Optiplex 580 Small Form Factor (SFF)Connectors:P1 - 24-Pin Mini ATX PowerP2 - 4-Pin ATX PowerP3 - Sata PowerP6 - P6 ConnectorPackage Included:1x Comput. This genuine Dell part is 235 watts. Dell Optiplex 380, 580, 760, 780, 960, 980. Good quality, good operation. Key Features. We promise we will do our best to serve you. P1 - 24-Pin Mini ATX Power. Compatible models shown above are for reference purpose only. not all compatible models are listed. Usage note Input / Output/ wires Output: 3.3V, 5V, 12V, -12V, 5VSB. 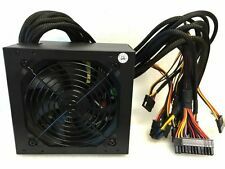 20pin, 24pin, 4 pin power peripherals, 4pin atx12v, SATA, Floppy. High energy efficiency. Ball bearing fan and grill. Input / Output Output: 3.3V 32A, 5V 30A, 12V1 33A, 12V2 33A, -12V 0.5A, 5VSB 5A. SLI (Scalable Link Interface) Ready, Quad SLI. Type: Flex ATX. Complies With ATX 12V 2.0 Version. Connectors: ATX Connector 24 (20 4) Pin X 1 PC, P4-12V 4 Pin X 1 PC, SATA 15 Pin X 2PC, Molex 4 Pin X 2 PC, Floppy 4 Pin X 1 PC. Compatible models: HP Enhance ENP-2322A ENP-2320 ENP-2322B. Noise Level Maximum of 32db at 100% system loading. Efficiency 70% Min. at full load. Compatible models shown above are for reference purpose only. Usage note Input / Output work on both Pentium and AMD motherboard system. Compatible Part Numbers: THRJK HNMMH DHVJN. Laptop Power Jack Board. Laptop Hard Drive Cover Caddy. Hearing Assistance. ADD TO FAVS. new arrival. Optiplex 7040 Small Form Factor (SFF). Optiplex 5040 Small Form Factor (SFF). 20 4 pin motherboard power connector, 2 SATA power connectors, 2 4pin molex power connectors. on/off switch on the back. Maximum Power Output: 650W. (1) 6 2 PCI-E Power Connector, supports 6pin OR 8pin PCIe video cards. Quiet 120mm Cooling Fan. 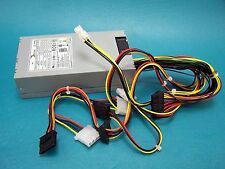 (4) SATA power connectors (on separate lines of cables for unrestricted reach). FOR Dell Optiplex 380, 580, 760, 780, 960, 980. This genuine Dell part is 235 watts. Good quality, good operation. Key Features. P1 - 24-Pin Mini ATX Power. P2 - 4-Pin ATX Power. P3 - Sata Power. We do our best to resolve any issue. Compatible with: A1098 A1097 A1096. Apple A1083 HD Cinema Display 30". Apple A1082 HD Cinema Display 23". Apple A1081 HD Cinema Display 20". Output: 24V 6.25A 150W. Rated power: 650W (W). 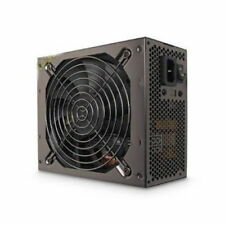 Power standard: ATX 12V 2. -Modular cabling for low energy use. - Ideal for basic desktop systems where low energy use, low noise. Authentication: CCC, 80 Plus. We will try our best to reduce the risk of the custom duties. 5.1V 2.5A output provides all the power your Pi will need. with Detachable On/Off Power Switch. Detachable On/Off Power Switch. 1 xDC ATX 250W power module. Input DC:12V. DC cable length :240mm 16AWG. Power cable Length :240 100mm 18AWG. (E.g. you brought wrong size or wrong item). Peak Power: 500W. ★Using 12cm hydraulic bearing LED fan, efficient and energy-saving silent fan, standby power 1W. Interface: 1x24P 1x4P 1x6P 2x(1 4Pin 1 SATA). Output Line Length: About 50cm/19.7.". Acer Veriton 6800, 6900PRO, 7600GT, 7700G, 7800, 7900PRO, M261, M275, M421G, M430G, M460, M460G, M480G, M490G, M498G, M680, M680G, M4610, M4610G, M4618, M4618G, M6610, M6610G. It's a feature that will benefit, not harm your system performance. Complies With ATX 12V 2.0 Version. It replaces the traditional 3 pin fan speed connector function. -Noise Level Maximum of 37db at 100% System Loading. Compatible models shown above are for reference purpose only. Power: 34W. Output: 5.1V--3.8A, 12V--1.2A. - opens in a new window or tab. Key Features. Installation instruction not included,toll not included. We promise we will do our best to serve you.